Great for hens laying soft shelled eggs. Can be added to the feeds of other pets too! This product is pure Dicalcium Phosphate produced from phosphate rock and contains no animal products. It promotes the growth of livestock and poultry and helps prevent the animal from ailments such as rickets and anaemia, and improves the quality of eggs. It is a natural, white, tasteless product that supplies Calcium and Phosphorus in the optimum ratio of 1.3:1. 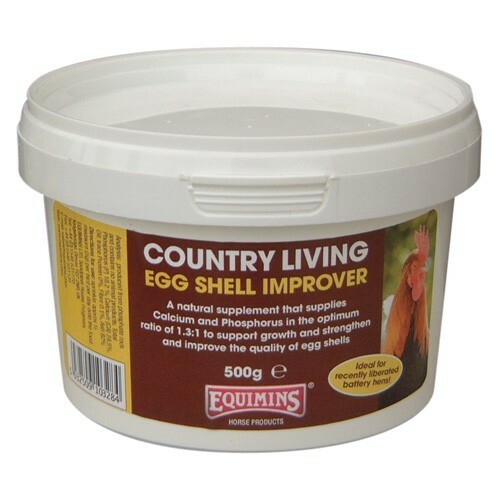 This product may be fed quite safely to any small animal and is suitable for dogs, cats, rabbits, hamsters, pigeons and poultry. Available in 500g, 1kg and 1.5kg tubs.